Moving into a building with multiple stairs can be a big challenge. Depending on how many flights of stairs you have to walk up, you could find yourself struggling to do the job safely and efficiently. Walking up the stairs with heavy loads can lead to injuries, slips, falls, and sore muscles. These tips can make the process easier. 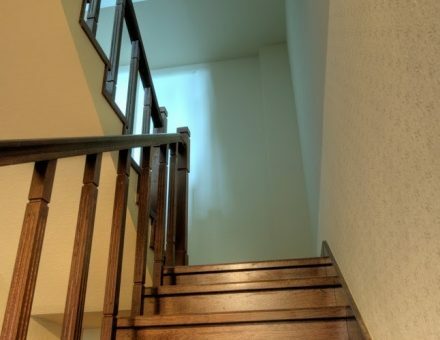 Look around your home and try to imagine yourself dragging your furniture up several flights of stairs. What would be the hardest things to take with you? Which things could you break down into smaller pieces, and which things would you have to take up in one piece? Which items do you want to keep with you, and which items do you want to replace? Downsizing can make your move easier, cheaper, and faster. If things are in your home right now that you just don’t care to bring with you, then now is the time to get rid of these items. Sell what you can, give away what you can’t sell, and then recycle or throw away whatever is left over. The more help you have in the moving process, the faster the time will go. Organize your friends and loved ones to help you on the day of your relocation. Offer to give them free pizza, soft drinks, and snacks to make the process less grueling for your friends. Avoid serving alcohol until after the move is complete. Alcohol can impair the ability to move furniture or boxes up and down the stairs safely, which could lead to accidents. Climbing staircases are enough of a challenge. You don’t want to add more trouble to the moving process by parking a long distance from your building. Securing the best parking spot possible helps ensure that you and the rest of your team will have a short walk from the truck to the building. If your building is on a busy street, you may have to get permits to park near the door, so check with your city hall before moving day comes. If the building has a loading zone, you may need to clear parking through your building landlord. Either way, make sure that you’ve made arrangements in advance of moving day so that you’ve cleared all other obstacles before the unloading takes place. Moving up and down stairs can take a lot out of you. Unless you pace yourself, you could injure your body or wear yourself out before you ever finish the work. Plan to take regular breaks throughout the moving process. Depending on how many flights of stairs you’ll walk up, how much stuff you have to move, and how much help you have, you may even need to break up the unloading process into a two-day period. Build in extra time to the moving process, because it will often take longer than you anticipate. Rain, snow, and hail can cause boots to be slippery, which can lead to accidents on the stairs. Extreme temperatures can lead to problems like heat stroke or heat exhaustion, which walking up and down stairs would make worse. If the date of your relocation is flexible, plan to move on a day when the weather is acceptable for moving. If you have no flexibility, then you may need to take extra care to do your move safely. Hand trucks are your friend during a move. Have several hand trucks on hand for moving multiple boxes at a time. For the sake of efficiency, have at least one hand truck for every person who will help with the move. Small boxes are easier and safer to move up and down stairs than larger boxes. Whenever possible, pack your items into small boxes. This may involve taking things apart before packing them up. If you must pack an item into a large box, try to keep the box as light as possible for easy transport. You’ll be freshest when you first unload the truck, so make an effort to move heavy and large items first. If possible, set aside the smaller boxes and smaller items until you’ve gotten the big and heavy items out of the way. Of course, the best way to avoid injury during a move into a building with many stairs is to work with a professional moving company. When you look for a moving company, know how many flights of stairs the movers will climb when they unload the truck in your new home, as this will affect the quote. For more information about moving into a building with lots of stairs and no elevator, contact Wheaten World Wide Moving. We’re happy to answer any questions you might have and provide advice for a smooth, simple relocation.